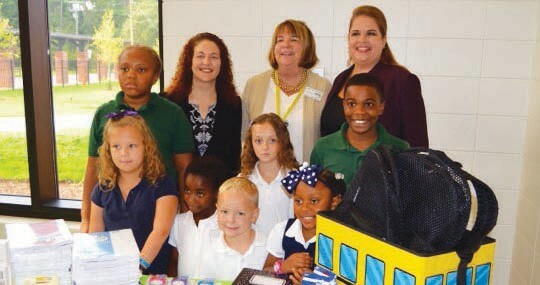 Carrie Hyatt (L), digital banking specialist at BankSouth, and Heather Peloquin (R), assistant vice president and relationship manager at BankSouth, presented the school supplies on behalf of BankSouth to Heard Principal Sylvia Wallis (C) and a handful of excited students. BankSouth, a top performing community bank in the nation, dropped by Heard Advanced Academy on Thursday, August 11, 2016, to make a donation of school supplies to help students kick off the new school year. BankSouth donated a selection of book bags, notebooks, rulers, scissors, notebook paper, pencils, pens, glue and a range of supplies typically needed on any given day in the classroom. For teachers, the bank donated stacks of printer paper, hand sanitizer, tissues and many of the items teachers typically supply for classrooms out of their own pockets.